It might just be me, but while going through these pictures some of them seemed sexier (yes I said sexier, I can say that now that I'm married) than usual. Almost scandalous. Maybe it's the hot pink lipstick. Maybe it's the studded heels. Or maybe it's the tousled hair, which was totally unintentional and the result of taking a long afternoon. Whatever the reason is, I'm totally okay with it. Starting a fashion blog was really scary, I'll be the first to admit that. I've wanted to do it for years but I never felt confident enough to take the plunge. Photographing every inch of my body and taking close-ups of my face with a DSLR. No thanks, not interested. However, a couple of months ago I started working out again and lost 10 pounds. That little victory gave my the extra boost of confidence that I needed to start my blog. So I did; and I was so nervous. I was inexperienced and had no idea what I was doing. But, after practicing and getting more comfortable in front of the camera, I feel like I've definitely improved. I'm not gonna go try out for America's Next Top Model anytime soon but I definitely feel good about the pictures I take. Hott Mama! Love these pics!! I love what you wrote in your last paragraph. I really think that we were all in that mindset when we started blogging. I really am having a blast a meeting the sweetest girls ever!! I love that top! Such a steal! Good for you for losing 10 pounds!! I recently have lost some weight while I've been blogging, and it's amazing to look back at pictures and see the results! I totally hear you, but your photos are SO good! There are always going to be negative people but you can't let it get to you! It is definitely nerve-racking but yay for you having the confidence to post! And I love your outfit sooo much. I have the same top, but you look better in it! Love the pink heels too! Lovin' all the pinks :) I feel u on being scared to start a blog because of any negative comments but who cares, ha! Yay for blogging! Love this outfit and I think you look great! lookin good!!! LOVE the ON shirt!! Okay seriously you look GORGEOUS! Your entire outfit looks straight out of a magazine and you are stunning! And I am with you on the whole blogging issue, it can be really scary to put yourself out there for anyone with access to the Internet to critique! Luckily your blog is totally adorable so I can't imagine anyone could have anything mean to say. 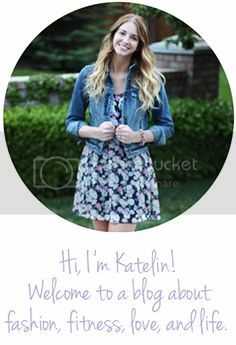 Keep posting all of your adorable outfits, it is totally inspiration! love that studded heels! i want! You look beautiful and great in front of the camera :) Stopping by from the link up - hope you'll come by and visit! Katelin, All of your worries or concerns are void, let me tell ya. Talk about scared. I had a blog for 8 months before I put my pics of me head to toe and I am old as dirt. You have nothing to worry about. Your blog is darling. Those shoes. OMyGosh! I need them for that price! I thought they were those expensive Valentinos and was going to freak, but then I freaked at this price and the styling.......... eeeeeek............MUST HAVE NOW! It is definitely scary putting yourself out there in such a public way with a blog, but so true that the blogging community is usually very supportive. Those heels are killer! Thanks for linking up with us...can you please just add a link to my blog to this post? I love that shirt!!! I can't believe it was only 8 dollars!! I'm tempted to get it! But you seriously are gorgeous!!! You have no reason to not want to take pictures! Show off that beauty haha!!! Such a fun & bright outfit. Loving the details and your gorgeous face, rockin' it! I have that same Old Navy top in blue! I felt the same way about starting a blog, but I've had the same experience. Only a few negative comments. Thanks for linking up last week. Hope to see you back tomorrow!